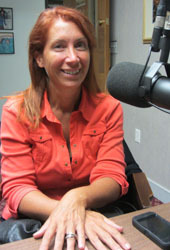 Monday Night Talk host Kevin Tocci and Joe Rossi are joined in studio by Dr Kate Roberts, who is a licensed psychologist, family therapist and couples counselor. Back to school is on the minds of most parents, most of the time we think of the children but coping with the demands of parenting can burn a parent out. A mother's blog went viral after she posted how burnt out she had become. Dr Kate Roberts shares some great tips and advice to help parents make it through the school year. If you're a fan of the show and enjoy our segments, you can either download your favorite segment from this site or subscribe to our podcasts through iTunes today!